Those old photos your newsroom has stashed away in file cabinets? They might be engagement gold on Facebook. In 20 hours, more than 1,000 people shared that on their Facebook walls, more than 3,000 people liked it (nearly as many as like the Macomb Daily) and more than 600 have commented (the combined totals have gone up by more than 200 just since I grabbed that screen grab and started writing). The numbers above don’t show this, but Maryanne reports that more than 84,000 people have looked at the photo. Feb. 27 update: Maryanne reports that 150,000 people have viewed the post, generating 1,656 shares, 1,139 comments and 5,562 likes. She did a story about all the response to the photo. Resuming the original post: This isn’t the first time I’ve shared a success story with remember-when photos from the Macomb Daily’s Facebook page. In my post on Facebook engagement tips last October, I noted a photo of the Plum Pit that went viral with more than 11,000 likes. It builds and extends your brand. Thousands of people have seen and liked something that says “Macomb Daily.” That always has value. Thousands of people have engaged with Macomb Daily content in the past day. The way Facebook’s news feed algorithm works, this makes them more likely to see the newsy updates on the Macomb Daily page that do link to the news site and do drive traffic. It gives a fun association to your Facebook page that might make some of those people not only more likely to see your newsy updates but more likely to click on future links. More people will like your page (and thus see future updates with links in them). Since the photo was posted, fans of the Macomb Daily page have grown by more than 200 386. 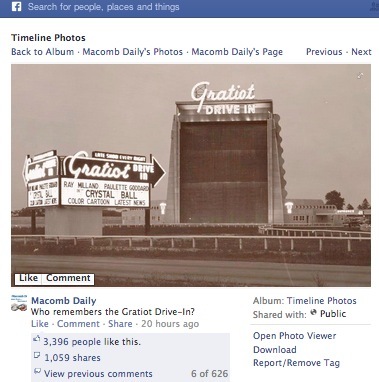 And, if you want to use your Facebook page to drive traffic to your website, create a photo gallery of remember-when photos and follow the question with a brief plug and link: “Who remembers the Gratiot Drive-In? More Macomb County vintage photos: http://whatever.&#8221; But I have to say, the brevity and simplicity of Maryanne’s questions helps drive engagement. (The Plum Pit question was: “Does anybody remember this place?”) I would see value in adding a link, but certainly not a necessity. Old file photos are a regular traffic winner on the Salt Lake Tribune website, with weekly “Look Back” photo galleries, a project undertaken by Photo Editor Jeremy Harmon. He told me last year that it takes about an hour to pull together a related group of photos from the files each week. Recent galleries have featured Utah scenes from the early 1900s, life on the Ute reservation in the early 1900s and dogs in Utah around 1900. “Our Look Back series is quite popular with our online readers and is typically among the most viewed items on the site every week,” Jeremy said in an email. Update: Jeremy added in an email after I posted this that the Ute reservation photos have been viewed more than 258,000 times and that the Look Back series has more than 5.2 million views. Of course, the photos don’t all have to come from your files. I see the Tribune is using photos from the Utah State Historical Society as well as its own files. And you can invite the community to submit old photos around a theme. What kind of success (or problems) have you had with using old photos to stir community engagement? We’ve had tremendous success here at Public Opinion in Chambersburg, Pa. with sharing our file photos in a Monday feature, “Where in Franklin County is this?” Readers have even sent in their own photos for us to publish and my voicemail is full every Monday evening with guesses. Facebook engagement with this feature spawned the Public Opinion History Club, now in its fourth month. We started with 15 readers meeting at our office once a month and at our latest meeting Sunday, we had 32. They are an enthusiastic group of folk who want to expand our club. Individuals bring in their old local photos or memorabilia and we have a “round robin” discussion of the pieces. I usually have a special photo exhibit set up, refreshments and a local speaker – on topics such as preserving old photos and documents. We are working on our “community room” to accommodate the larger crowds. Within minutes of posting an old photo to FB, we have a great community conversation rolling…terrific fun and great positive community engagement. We have a weekly Then & Now photo series that has been very popular on Facebook. Photographer Jesse Tinsley finds a photograph in our archives and then goes out and creates an image of that same location today. He also writes up a brief history of the building or location. It runs every Monday in our region section and I post it on our Facebook page most Monday mornings. While they haven’t gone viral, they are always crowd pleasers, with lots of shares. Thanks for the additional ideas about archive photos. I will have to give that a try.